Editor's Letter: New Agenda For BRICs? The annual meetings of the World Bank and the International Monetary Fund in Washington coincide this year with an important change in the global economic climate. Early, faint signs that advanced economies had begun growing faster than developing ones are now becoming more pronounced in economic data. The end of summer in the West also coincided with renewed turbulence in emerging markets—and in their local currencies in particular. There are discussions of a possible foreign exchange fund to be created by the BRICs to support their currencies against the negative effects of the dollar—and of other currencies, such as the euro and yen. These developments open new questions for all global economies. For many years emerging-markets countries have asked for more representation in the leadership and agendas of multilateral organizations. How will these changes affect the attitude of leaders from emerging markets? Will they become more inward looking? Will the turbulence and loss of competitiveness of some currencies translate into more restrictive trade and/or currency policies? Are we about to experience a new wave of protectionist moves in the developing world? We don’t yet have the answers to these questions, but we expect them to be debated in Washington in October. In fact, they will likely take center stage. Uncertainty over timing of Federal Reserve tapering in the US, and even about the successor of Ben Bernanke as chairman of the Fed, has not helped: A lot of turbulence has arisen as investors await a clear sign from the Fed—and the central banks of the West and Japan—regarding their future moves. 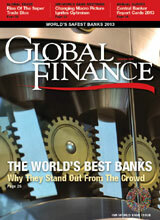 At Global Finance we celebrate excellence in banking and financial services. 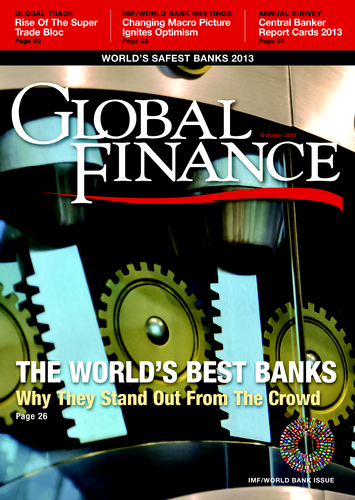 For over 20 years our October issue has seen the publication of our annual ranking of the World’s 50 Safest Banks, along with the annual Central Banker Report Cards. There are some renowned names absent from the rankings. We salute the winners, particularly the repeat winners, and their capacity to shine even in tough times.